One of the earliest children's programs on Baltimore TV, "Paul's Puppets" was hosted by husband and wife team Edie and Bernie Paul. Their grandson Adam Paul promises more information on this program in the near future. "Pop goes the weasel, and the Jack-In-The-Box jumps out of his house." In 1953, Bert and Nancy Claster said goodbye to Baltimore's Hippodrome Theater where they'd been producing variety stage shows, and entered the world of local television, creating "Romper Room" for WBAL. The in-studio classroom of pre-schoolers played games, made music, marched, and got lessons on safety, morality, and fair play from their teacher. Nancy Claster filled that role by default after the show's original teacher cancelled just before production was to begin. Chances are that unknown teacher lived to regret her decision, as "Miss Nancy" and husband Bert eventually syndicated "Romper Room" to more than 100 television stations across America, where it aired for the next 40 years. But it's beginnings were in Baltimore, and since it debuted on WBAL, we've included it with Channel 11. During it's long run, "Romper Room" actually had the distinction of being the only show in history to air on all three Baltimore VHF stations. 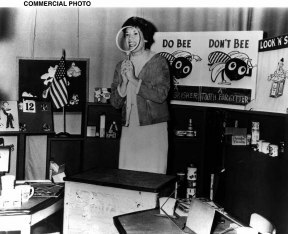 Children appearing on "Romper Room" were treated to snack (but not before saying Grace--my, how times have changed) and were encouraged to be good little "do bees" instead of "don't bees" by Miss Nancy and "Mr. Doo Bee." And the show always concluded with Miss Nancy gazing into her "Magic Mirror" to see and mention the names of boys and girls watching at home. In 1963, Nancy Claster stepped down as teacher but remained with the program to train local hostesses around the country--more than 500 by the time the show ceased production. She was replaced in Baltimore by her daughter Sally Rogers (real name Sally Claster Gelbard). Ultimately, a single pre-recorded version of "Romper Room" aired in syndication across the country, hosted by Molly McCloskey. "Romper Room and Friends," as the show was eventually called, ran in syndication for another three years after production ended in April 1991. "Romper Room" records and merchandise were produced and sold over the years, and Hasbro eventually purchased Claster Productions in the 1970's. Bert Claster died in 1974, while Nancy Claster passed away from cancer at her Baltimore home on April 25, 1997, at the age of 82. Walk the plank to Page 2!